Once upon a time Orkut was the biggest social networking site, at least in India and Brazil. Later on Facebook became the game player and till now no one could beat it. Google launched many other products like Google Buzz, Wave and finally a stable one known as Google+ but it closed Buzz & Wave as they could not stand in the crowd. Google+ is doing fine rather good in many terms and hence Google decided to close Orkut. In the first week of July, it started mailing the users of Orkut about the news though they published the same on their blog as well on 30th June. Now, today is the day after which Orkut will not be available for use to anyone though they will retain an archive of all public communities, which will be available online starting September 30, 2014. The community archive will be available only if the community owner changes the privacy of the community to open and available to search engines. You can refer the link here to see the settings that you need to apply to include your community in the archive or to exclude it. You should have exported your photo albums to Google+ by now but if you have missed the deadline of today then you can download your Orkut information as explained here. If you have important data in or related to your Orkut account then you must download it before September 2016 as after that it won't be available for download. I met many people on Orkut, few became friends, few were part of life and few are no more in this world and hence have many memories associated with it for the rest of my life. Its really sad to see it going like this and Google could not do anything to retain this awesome site. Still, I like the forum feature of Orkut like anything and wish if it could be applied to Facebook or Google+ where people share so many things be it related to any topic. I owned many communities in Orkut which now have been converted to domain names. When I was in the learning stage of my Computing life then I learned many things via Orkut forums as well which were inbuilt feature of any community where people could start a thread as per their need. I don't think that I will ever forget Orkut in this life and wish if Google could have done something to put life in the product. 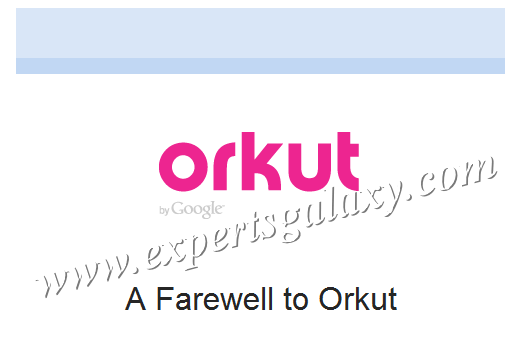 But everything that starts comes to an end at a point and today is the end of Orkut. If you have anything special related with the site then do let us know using the comment system injected below.